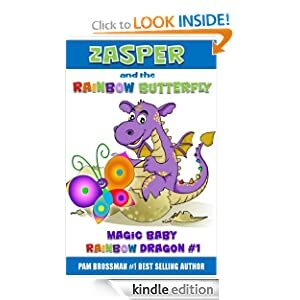 -- Baby Zasper and the Rainbow Butterfly is perfect for children 3-6 who love friendly dragons, fairies, pixies, butterflies and fairy tales. It is a very happy and friendly picture book perfect for reading as a bedtime story. The book is filled with lots of colours of the rainbow and friendly fun characters that your children will love. There is also colouring pages available for download for your children to enjoy. In the first Baby Zasper Adventure, Zasper comes down with a terrible rainbow cold. While he is relaxing down by the rainbow falls he meets a rainbow butterfly who is very sad. Zasper and his best friend Joey the fairy try to help the rainbow butterfly get her colours back.